Hi, I am interested in your 1936 Chevrolet Other Chevrolet Models (stock #1326-NSH) listed on Autotrader for $42,995. I'd like to get more information about this vehicle and confirm its availability. If you love the look and feel of the really old vintage trucks, but dont own one, is it because original pre-war trucks can be finicky and not really up to speed on modern roads? And maybe because an over the top street rod isnt your thing either? 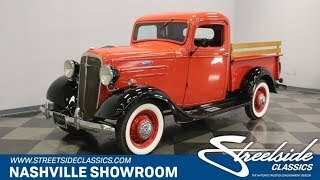 If so, then check out this 1936 pickup. Its in that sweet spot between the two extremes. A 12-volt electrical system and modern 4-cylinder make it reliable and easy to drive without being over the top or messing with those classic good looks. Check it out. Those classic good looks start with a long, piano hinged hood that leads to a tall mesh grill trimmed in chrome. Individual headlights are perched between the hood and the separate fenders and a simple chrome bumper underlines everything. The cab, hood and bed are coated in Omaha Orange, which is this trucks factory original color, and black for the fenders and running boards. The spare tire mounts on the right side of the cab and there is Chevrolet bowtie emblem on both sides of the hood. Out back there is a simple pickup bed with a nice wooden stake side. Part of that sweet spot this truck is in, is that this is a truck you can actually use. Go ahead, load up the bed and make your deliveries. Youll be arriving with supplies in style in this truck! Open the door and you will be reminded of a simpler time. As you step easily into this upright cab, the pressures of the modern world seem a little further away and not quite so noisy. The door panel and dash are simple and nice looking in the same Omaha Orange as the outside. There is a big three spoke steering wheel and behind it are the stock gauges with the speedometer in the center flanked by two engine gauges. Below the dash are a trio of modern gauges to keep track of water temp, oil pressure and voltage for the modern motor. There is a likeness of the truck in front of a Mail Pouch barn on the glovebox, and a shifter for the automatic transmission is on the floor. A simple bench seat in black vinyl is roomy, comfortable, and old school correct. Fold open the piano hinged hood and you will find a 4-cylinder, Iron Duke engine nestled down in there. It is a throttle body injected 2.5-liter motor which may be better known as the 151, or the Tech IV engine. They are simple and reliable. The 12-volt electrical system means a stronger battery and a healthy starter for easy starting even in the winter, and you get good reliable lighting as well as compatibility with modern accessories. The power the engine makes runs back through a TH350 automatic transmission to the rear axle which is mounted on leaf springs while the front suspension is a solid drop axle on leaf springs. The rubber meets the road through wide white wall tires mounted on real wire wheels painted to match the body with chrome center caps that have a bowtie in the center. Classic, but also modern, simple, reliable, and useful. If this is the sweet spot for you, then come on down and get your new/old truck.